JIO Telecom Network , the most rapidly grown telecom network . Jio is the first Indian telecom network which has grown so fast and compeleted the target of million users in few month . Due to excitng and attracting offer launched by jio it attracted more users toward itself . And after the launch surrounding of competition has setup between telecom network companies .Each telecom network are trying to compete with the offers launched by jio . 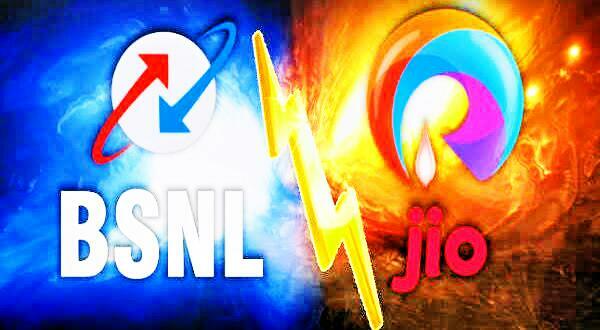 And every telecom network companies are launching their own offers similarly to jio offers and trying to beat jio offers .So Bharat Sanchar Nigam Limited ( BSNL ) is also launched its new 429 Rs Offer to compete with jio 399 Rs Offer . BSNL has unveiled a new voice and data plan called ‘Plan 429’. Under this plan, the prepaid users will get unlimited voice calls and 1GB data per day for 90 days. So basically, you will have to pay just Rs 4.76 per day to get unlimited voice calling and 1 GB data and 143 rs /month . Well, to get Plan 429, you need to do is go to your mobile operator and recharge your number with Rs 429, post which it will be eligible for free voice (local/STD) on any network along with 90 GB of data (at 1 GB per day) for 90 days on PAN India basis (except Kerala Circle). “This Voice & Data Centric Plan is available for Rs. 429/ ie Rs. 143/ per month which gives unlimited voice (Local/STD) on any net and 90 GB data ( @ 1 GB per day) for 90 days, which is the most competitive plan in present market scenario,” said R.K.Mittal, Director (CM) BSNL, in a press statement, according to the IE report. Read Also :- To Compete With Jio 4G Phone Airtel Is Planning To Launch Their 4G Phone At Price Of 2500 Rs . BSNL's Rs 429 plan launched to competing with Jio's Rs 399 recharge plan, which offers unlimited free voice calls (local plus STD) to any network in India and 1 GB data at 4G speed per day for 84 days, say industry experts. Launched in July, Jio's Rs 399 plan is one of the most popular recharge plans of the company.